Have you heard of the oil cleansing method? It’s an ancient facial care technique that has found a new audience in today’s natural body care circles. The idea behind oil cleansing is “like dissolves like,” an adage used by chemists about how solvents work. The solvent, in this case liquid cleansing oil, dissolves similar substances, in this case your face oils. Proponents promise that it works great for cleansing without stripping or irritating your skin. The oil cleaning method uses either a commercial product (several large cosmetic and skin care companies make oil cleansers that retail from $5 to more than $100 an ounce) or a DIY mixture of castor oil and extra virgin olive oil or sunflower oil. To cleanse you mix your desired ration of oils then massage them into your skin for a few minutes (as though you were getting a facial). To remove the oil you saturate a washcloth with steamy hot water, place it on your face, and allow it to cool. You then wipe your face and repeat the hot washcloth drape/wipe several times allowing the steam to penetrate your skin. 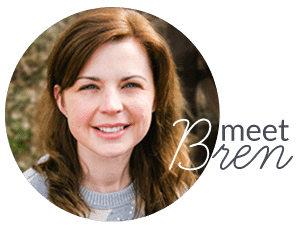 Poke around on the internet and you will discover that some people absolutely LOVE the oil cleansing method and some people absolutely HATE it. There’s not much middle ground. 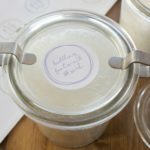 I love trying new, all-natural body care DIYs, so my interest was piqued when I first learned about the oil cleansing method. I was also on the hunt for a new, non-toxic facial care routine. I had been using an all-natural, vegan facial care line for a few years. It consisted of a foaming facial cleanser with a toner then a SPF lotion during the day or a moisturizing repair serum at night. I was satisfied with the results, but it wasn’t exactly cheap (the whole routine was about $80 every 4 months) and it had a lot of steps for a lazy lady (aka busy woman) like me. Eventually the toner would get stashed in the back of the medicine cabinet, I would forget to buy more serum and I would begin grumbling about how my skin was looking. I knew I wanted to try the oil cleanse but I had a few concerns to address. First, I needed to simplify the oil cleanse – if I can’t manage toner I doubted that I would sit around for 10 minutes each night with a steamy washcloth on the face. Second, I wanted to make my own product as the commercially available ones contain chemicals and artificial fragrances that I avoid. Third, I wanted to eliminate castor oil and olive oil, if possible. Castor oil, while all natural, is thick and heavy. It can feel sticky on your skin and has a distinct smell that does not appeal to me. Olive oil also troubles me in light of recent studies showing that much of the olive oil available in the US (as much as 69%) has been mixed with colorants and other cheaper oils. When aiming for pure, affordable, natural skin care; I want to be absolutely sure of all the ingredients! 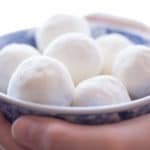 I set out to develop my own oil cleanse, relying on the information I had learned from making my own body lotions, lotion bon bons, and body balms. One of the oils I love for body care is sweet almond oil, it’s made by pressing almonds and is well known for softening and conditioning the skin. 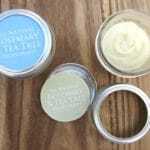 It is so mild it is often suggested as a treatment for eczema, psoriasis and inflamed skin. I often use it as a quick moisturizer when I am getting out of the shower. It absorbs quickly and feels very light. You can even use it on your lips. Another oil I wanted to use was rose hip oil. Rose hip oil (made from pressing the “fruit” of rose bushes) is often recommended for its healing properties; it is extremely high in Vitamin A, Vitamin C, and essential fatty acids (omega-3 and omega-6). It is used as a natural treatment for damaged, weathered, and scared skin and is touted as a therapy for wrinkles, premature aging, and sun damage such as dark spots and hyper-pigmentation. Finally, like sweet almond oil it absorbs into the skin easily. You may have noticed that rose hip oil is a big trend in beauty products right now- Miranda Kerr even started an entire skin care line based on rose hip oil. Drop about ½ tsp of sweet almond oil into the palm of your hand then add a few drops of rose hip oil. The brands I use are listed at the end of the post. Mix the oils together by rubbing your palms together. Let the oil soak in a bit (just a minute or two). I use this time to massage my cuticles with the remaining oil or brush my teeth. You can open your eyes! Wipe your face clean with one side of the wash cloth. If you are wearing makeup you will see it all come off, if you are not wearing makeup you may see the yellowish color of the rose hip oil. Turn the washcloth over and wipe your face clean a second time. Concentrate on any problem areas. The added bonus is great exfoliation from the fabric of your washcloth. If your skin is very dry or you want extra rejuvenation you can massage a drop or two of rose hip oil into your skin. I occasionally do this at night. When the weather has been cold or my skin is dry I rub a few drops of organic Argan Oil onto my face before going to bed. I’ve been on this modified oil cleansing skin care routine for about 3 months. My skin has not looked or felt this good since I was in my early 20s (I’m double that number now)! My pores look smaller, I have not had any break outs, my skin is baby soft and I feel like my hyperpigmentation (thank you pregnancy) is less noticeable. 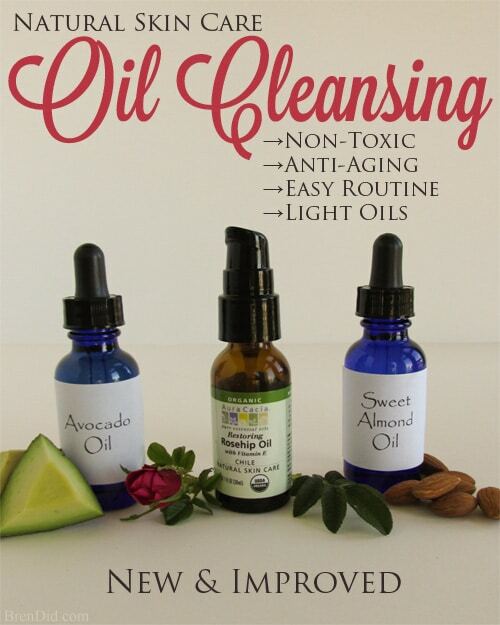 My modified oil cleanse is all natural and non-toxic (it’s also organic if you buy organic oils). You know exactly what is in your skincare routine: no artificial ingredients, no synthetic fragrances, and no dodgy chemicals. The routine has only two simple steps. Couldn’t we all use a time saver? Does this sound too good to be true? It only gets better! It only costs $11.17 for a six month supply (1 oz of rose hip oil & 4 ounces of sweet almond oil). That’s a $300 annual savings over my previous skincare routine and I like the results MORE! 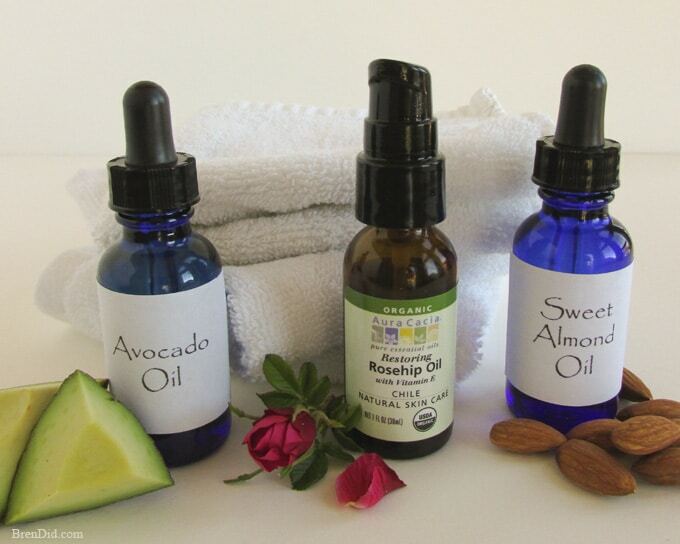 I have also used avocado oil in place of sweet almond oil in this routine. I honestly can not tell a difference between the effects. 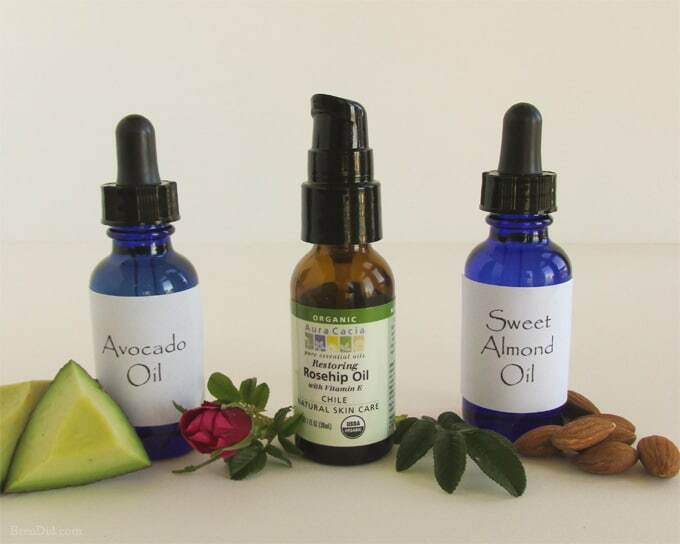 Avocado oil, like sweet almond oil, is used to treat eczema, psoriasis, and other skin ailments. It is non greasy, absorbs quickly, and is recommended for sensitive skin. It can be used as a general skin moisturizer. If you can not use sweet almond oil or want to try a different combination, I would start with avocado oil as your base oil. It’s going to take a few days (even up to a week) for your skin to adjust to the new routine. Many commercial cleansers strip skin of its natural oils, leaving it tight. Your skin ups oil production to compensate and you get into a vicious cycle of over cleaning then over oil producing. When I started this oil cleansing routine I would wash my face at night with my current cleanser (about half the normal amount) before using the oils. I would also cleanse with oil both night and morning (I only used the oils in the morning no cleanser). This twice a day cleaning lasted about two weeks. Now I cleanse with oil at night and simply wipe my face with a warm washcloth in the morning. If you wear a lot of eye makeup (especially waterproof mascara) you might want to run a cotton ball with a bit of Sweet Almond Oil (or Avocado Oil) on it over your eyelids and lash area to remove the makeup before starting the oil cleanse each night. This will help remove the mascara and you won’t look like a raccoon or stain all your washcloths with makeup. 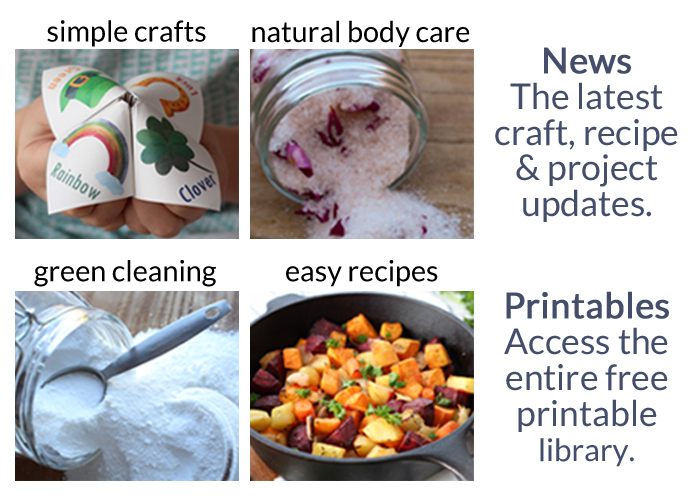 Subscribe to my free weekly email to learn more about DIY non-toxic body care. THANK you.. you explain things so well. I am Soaper , so use a lot of wonderful oils. in the evening I use my shew butter/ charcoal soap. rinse off & then apply the oil. I used a bit avocado & a few drops of Jojoba oil, which is SO good for your skin. I spread it on in an upward motion. just use a damp warm cloth to blot it after a couple minutes. In the morning I just splash with cool water. love all the info you provide. Just found your site through Pinterest and I am really loving all your ideas! I was curious, have you ever made a natural toner to use after the oil cleanse? I know there is a line sold here in Canada from Rocky Mountain Soap Company and they suggest using one of their toners after their oil cleanser, but I just can’t afford their price point (though I DO love their products). Do you have any thoughts/ideas of how to concoct a natural purifying/calming toner? Thanks Jessa! I have not made a toner yet but sometimes use unscented witch hazel, apple cider vinegar or my rose water glycerine spray. Rose water also works well on its own. The witch hazel is for normal skin, the vinegar for more oil skin and the rose water for dry skin. Hope this helps! 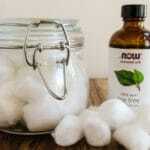 I just found your site and I am excited to try this oil cleansing method. I have tried so many expensive cleansing products with varied results. I also have Rosacea around my nose which makes it even more difficult to find products that won’t irritate or cause an acne flare. I want something natural and this sounds so easy to do. Thank you! Thanks Lynda! I hope it works well for you. I use rose hip oil to soothe my daughter’s eczema, I hope you like it for rosacea. I don’t use face wash anymore and I think I will try using your idea of a drop of tea tree oil next time I get a blemish. Thanks Sierra! I will have to try the coconut oil for makeup removal. I generally use almond oil or avocado oil. I agree, I like making my own products vs buying. So glad you found the site! I’m so glad you are going to try it! 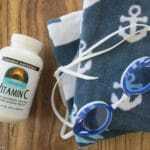 I use avocado oil on my daughter’s eczema (it gets irritated from swimming). It works well for her. I hope you like it too! Such great tips. I love reading your posts. Keep them coming! I tried the roasted garbanzo beans and LOVED them. I can just hear your voice and see your hands gesturing as I read your posts. 🙂 Thanks for all you do! Julie. Thanks, Julie. You are such a benevolent reader. Your comments always bring a smile to my face!